I try to make it an annual event. Sometimes, though, work gets in the way. I hadn’t been the last two years. It was great to get back. In years past I’ve been with both daughters, or one daughter… This year, I talked my friend Sue into going. We both took Friday off and made the 2-hour drive early enough to ski the Ridge Trail before dinner. No one had done the Ridge Trail in a couple of days. In those two days there had been a dumping of snow, 15 minutes of rain, and another dumping of snow. The ice layer that was put down by that rain was not thick enough to hold us up on top of it. So breaking trail was interesting! Challenging! Heart-pumping! Exhausting! But we were up for the challenge. We took turns breaking trail. Even though we were going mostly downhill, it was still a lot of work. In some spots, the trench we made was up to our knees! We were grateful to a gentleman who passed us and broke a small section in the middle of the trail before he turned around to return to the start. And we were even more grateful to Dave and Allison who were taking a late afternoon run from the Lodge making our last half mile or so smooth sailing. Other than that, we broke most of the (approximately) 6.5 miles of trail ourselves! The Ridge Trail is such a nice trail… It starts at the DCNR office, and after an initial incline that we call the Warm-Up Hill, it becomes a gentle descent all the way back to the Susquehannock Lodge where we were staying. If you can catch a ride up the hill, or carpool so that you have a vehicle at the lodge, it is just ideal. On Saturday, I cross-country skiied the Ridge Trail again with new friends from the Lodge while Sue went off to Denton Hill State Park to downhill ski. Skiing on Saturday was such a delight. “Groomed” trails (ha ha – thanks to Sue and me!) and absolutely perfect weather conditions made Potter County’s claim to be “God’s Country” seem justified. For some reason, I took no pictures inside the lodge… I wish I had! Ed and Carol are fantastic hosts at the Susquehannock Lodge. They fill us with delicious food and provide lovely accomodations at very reasonable prices. I recommend them heartily! Check out the link below. 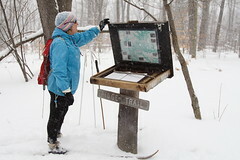 This entry was posted in hiking, outdoor recreation, winter and tagged cross country skiing. Bookmark the permalink. ← Oh My Gosh, You Guys! Oh what fun! 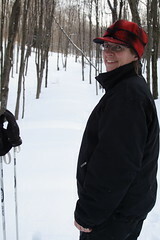 I tried x-country skiing for the first time (see my blog) and thought it was great! The second trip was much better. I can’t wait to go again. Thanks for sharing! Wow! I love your books! I can’t wait for Race for the Sun is published. From the cover, I can tell it’s full of spring ephemeral flowers, my favorite spring thing (along with vernal pools). I blogged about them, too! What a fun vacation outing! What a great hat you have! Is it a Stormy Kromer? This style of hat supposedly originated in this area. That must have been major to break trail through those layers of ice and snow. You must have been really chugging water to hydrate! Looks like a great time–I can see why you love winter. @karen – thanks for clicking by. I checked your blog posts… nice photo of your belly-smacker into the snow! I got a new lens and am hoping to use it to take some better wildflower pix than I have… Then the Race book will get done… maybe by next summer. @Don – Yup! It’s a Stormy Kromer! My hiking buddy was tired of hearing me complain that I didn’t have a warm hat with a brim, so he got me one for Christmas. @Susan – I think the stuff we were drinking at the lodge may have done the opposite of hydrating us… but it sure was relaxing! @Joan – Winter is absolutely the best season. Very interesting read along with some cool (or should I say COLD) photos. I can relate. While I am a photographer at heart, I am also the president of our local hiking club. Took a small group on an 8-mile hike over snow and ice this past weekend. Every season comes with its own inner and outer beauty but I am partial to the transitions – Spring and Fall. 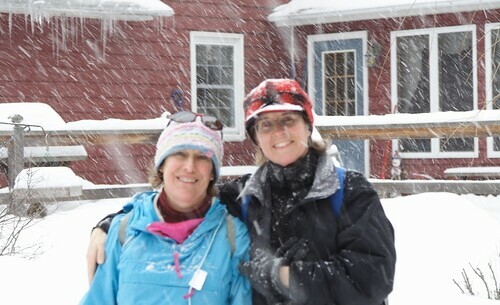 Jennifer – After reading your blog for several weeks and seeing your obvious love for cross country skiing, I am going to give it a try. 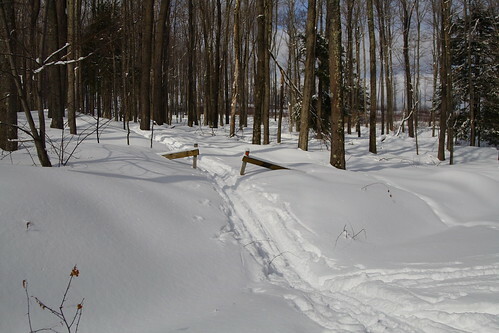 I’m heading out to Two Mile Run county park here in Venango County, PA to rent skis and add another winter activity to my repitiore. I’ll take pictures, of course and if I’m still able to walk to my computer after my adventure, I’ll post them in my Picasa albums. Your cross country skiing weekend would be right up my alley! Something about the quiet of the woods when it is covered in snow and getting away from everything for an overnight suits me. Thanks for sharing this. But, seriously, you can see some photos of my very first cross country skiing adventure at http://picasaweb.google.com/1themanfromvan/TwoMileRunCountyPark#. The last eight photos. 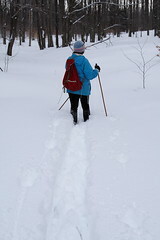 In the interest of flat, easy terrain – I skied on the frozen lake surface at first – then took to the trail. I am so glad to have crossed paths with a ruffed grouse yesterday, because I Googled my way to your perfect photo of one, which I’ve included in my post today, with a link to you as credit.